The Boulder County Mosquito Control District (BCMCD) was established in 1995 by the Board of County Commissioners to protect residents from the health risks, annoyance, and discomfort associated with mosquitoes. The Boulder County Mosquito Control District surveyed residents in 2011 to gather feedback on mosquito control practices. The responses overwhelmingly indicated that people want mosquito control to continue. Many stated that mosquitoes negatively impacted their ability to enjoy the outdoors. The Boulder County Mosquito District encompasses approximately 180 square miles of eastern Boulder County. 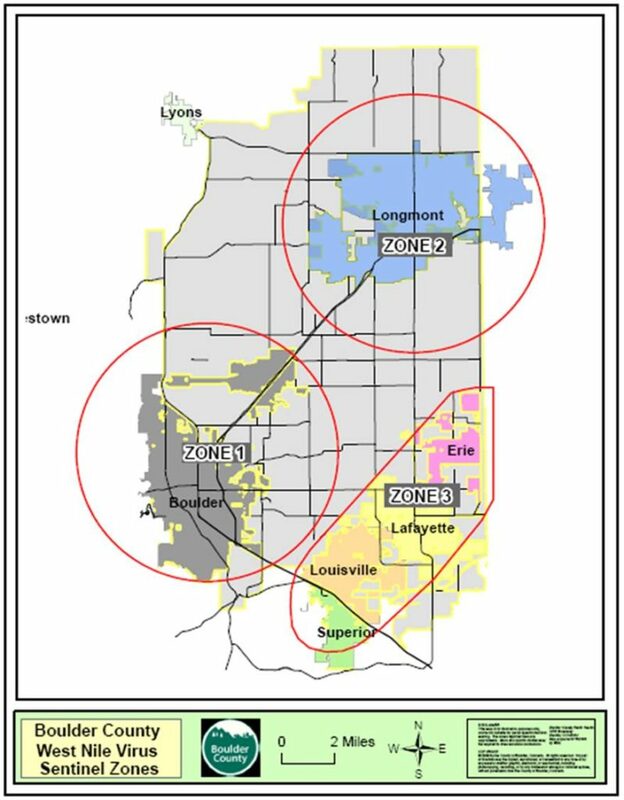 Because the residents who live within this district pay for mosquito control services, Boulder County can only provide mosquito control service to those persons residing within the district. The Boulder County Mosquito Control District (BCMCD) Program is overseen by a citizens’ advisory board which is appointed by the Boulder County Commissioners. More than 94% of the program is biological and physical control of mosquito larvae prior to adult emergence. Adult Mosquito Control comprises less than 6% of the program. Answering questions and providing information on mosquito control. Investigating reports of mosquitoes or standing water. Excluding district residents’ properties from spraying, if requested. Notifying district residents before spraying in their neighborhoods. The board promotes an integrated pest management program, collaborates with agencies to control mosquito-borne diseases, educates residents in the BCMCD to help identify and reduce mosquito breeding sites around their homes and neighborhoods, and advises the County Commissioners and Boulder County Public Health on mosquito control activities and needs. The Boulder County Mosquito Control Program (BCMCP) is one of the most environmentally conscious programs in the nation. Mosquito control services in Boulder County are contracted to a private company, Vector Disease Control International (VDCI). VDCI utilizes an integrated pest management approach to safely and effectively reduce mosquito populations. All mosquito control materials used in Boulder County have been shown to be non-carcinogenic by the National Cancer Institute, and are registered for use by the Environmental Protection Agency (EPA).